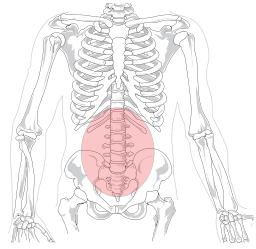 Principal Pilates - Blog: How does Pilates help manage persistent lower back pain? How does Pilates help manage persistent lower back pain? Lower back pain can be broken down into acute and persistent. The latter is pain that continues for more than three months after the initial episode. Persistent back pain defines the ongoing back problems that many of us experience. And why do we suffer pain in our lower backs? If we sprain a calf muscle in our leg, it causes acute pain and we initially rest the muscle and avoid over-loading it or over-stretching it. Then, when the calf feels better we start to use it again and we gradually build back our activity levels on the leg. In contrast, lower backs are more complicated. For starters, it's much harder to move around without bending or twisting or loading our backs - than it would be for a calf or a wrist. And then something changes in our pain response, meaning we carry on feeling pain long after the initial tissue damage has repaired. Our sensitisation to pain becomes different. Our pain threshold lowers and we feel pain when we make small movements that shouldn't damage or hurt our backs. Our bodies are tough and designed to take heavy loads. If we feel pain because we've lifted an excessively heavy weight then that might cause a back injury. However, feeling pain when we lift a leg to get out of a car, is unlikely to be due to actual damage to our backs. The pain is real pain, but it is likely to be part of the increased sensitivity to pain, rather than due to actual injury. And so with this persistent pain, we alter the way we feel about our back and the way we hold ourselves and the way we move. We become less likely to move our backs and we develop stiff, tense muscles, altered blood flow and vertebrae and discs that don't get enough movement to stay healthy and hydrated. Now, we're stuck in a pain cycle of increased awareness of pain and protecting our backs by moving less. Often there are other factors too. We sleep less, we feel increasingly stressed and there may be other difficult events going on in our lives at the same time, all coming together at once. Secondly, it helps us to relax our mind and body and so we can feel more confident about movement. The Franklin Method releases are particularly good here. Then Pilates helps us to find the gentle movement that we need for our spine to be more mobile again. And last but not least, Pilates builds up the core stability that we need to stabilise our lower back and pelvis. So if you haven't yet tried Pilates, do get in touch to talk about a 1-1 or joining a class.